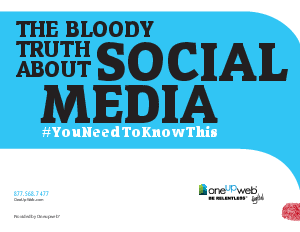 Separate fact from fiction with Oneupweb’s new white paper on social media. By now you've heard the buzz about social media, and it's true, it is a cornerstone for branding, sales growth and PR. But there are a lot of wild digits and fantastic claims out there. This white paper separates fact from fiction when it comes to Twitter, Facebook, YouTube, blogs and the role social media should play in marketing plans.